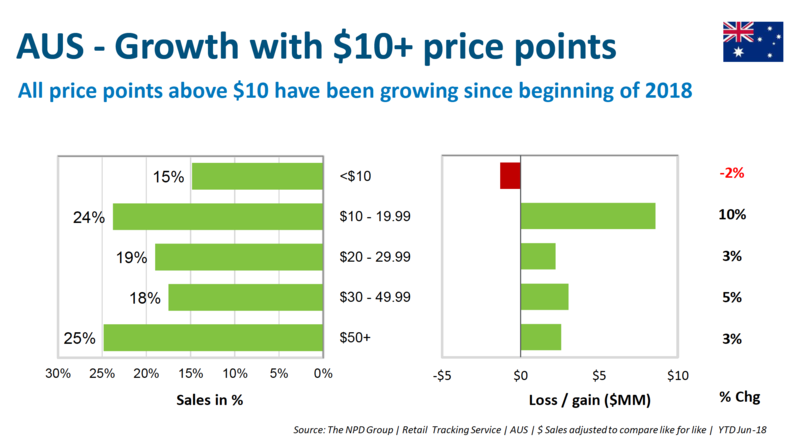 Good news: Independent industry driven analysis of toy purchases at retail in Australia in the last financial year reveals significant growth in $10+ product purchase points. All price point bands above $10 show growth in the research results. Even at the $50+ point, which accounts for 25% of revenue, we see 3% year on year growth. Elsewhere in the report is evidence that the toys category is strong. I see this also in the benchmark data I access and from my own stores at a local business level. What is most interesting is the insights as to licence and key brand opportunities. With toys being a fickle category and prone to quick growth and quick decline, having good data can be key to driving success. I think any newsagency in any location could offer a consistent toy range and use this to attract new shoppers to the business. While I am still working on a benchmark ratio, I am leaning toward to suggesting a reasonable goal could be toy revenue equal to at least 50% of card revenue While I know stores significantly above this, most the of the newsagency channel is below so I think a modest benchmark revenue goal is more useful at this time. In considering this, toys means toys plus puzzles, plush and collectibles as that is how the analysts assess it. And to be clear, the toys I am talking about here are those from major suppliers, not cheap generic brand toys you might put on a spinner on consignment. Where there is traction with toys, consider adding good quality kids books, especially board books. Grandparents love the opportunity to get grandkids away from ipads. Excellent point Colin books are extremely popular with children and Grandparents. Children love the ownership of a book whereas internet is a disconnect. newsXpress pitched to its members last year and this year a multi-category approach to serve the grandparent shopper, as distinct from the toy destination shopper. Both are valuable yet different in intent. Each group of shoppers bring different knowledge to their shopping. Each is valuable if you can leverage that. There are good suppliers outside of those traditional to our channel who serve these spaces well. Are there still toy brands and wholesalers who will refuse to sell to retailers outside the traditional toy space (i.e. newsagents in this case) or are those suppliers now recognizing newsagents as a viable place to sell their product?